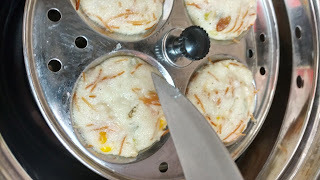 "Rava Idli" is a popular South Indian cuisine made using Semolina or sooji. It is not only easy to prepare but healthy and tasty also. 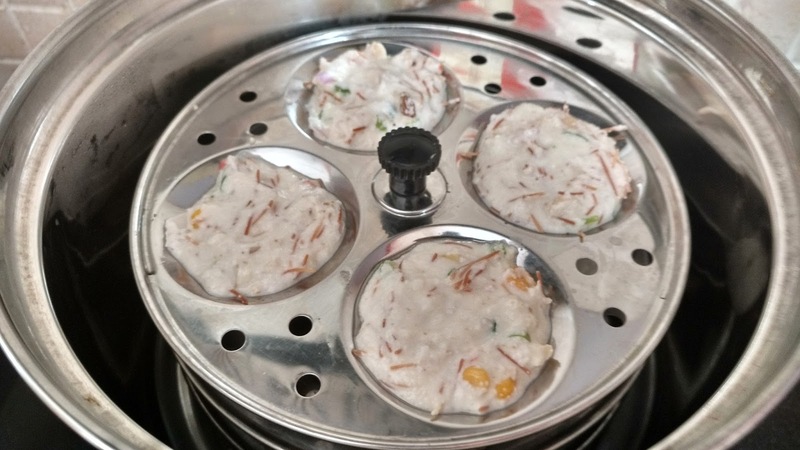 Rava idli is also know by the name Sooji Idli. 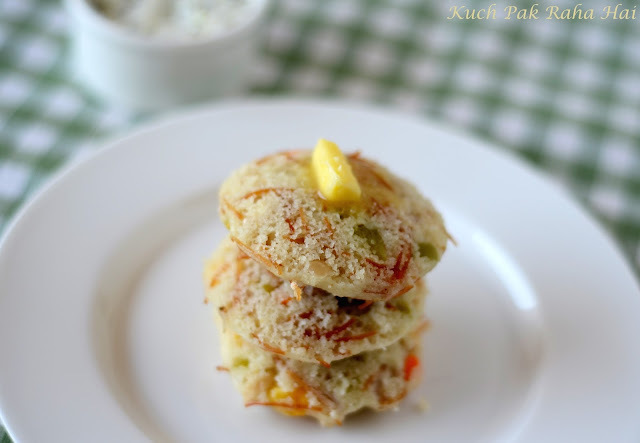 It is soft and spongy in texture and tastes delicious with coconut chutney. I have added a twist to the traditional rava idli recipe by adding nine more ingredients, hence calling it "Navratan Idli". 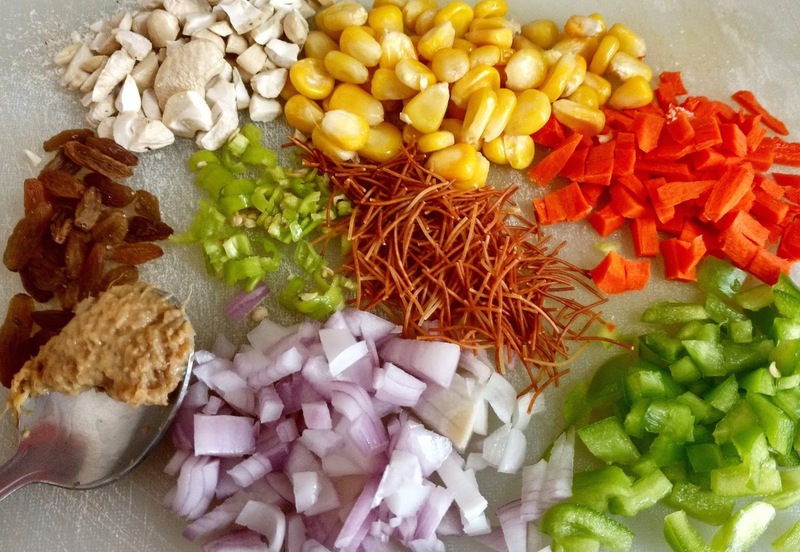 These nine ingredients consists of lots of colourful vegetables, nuts, raisins and vermicelli. It is healthy breakfast recipe. The Navratan rava idli not only makes the breakfast wholesome but also bursting with flavours and aroma. 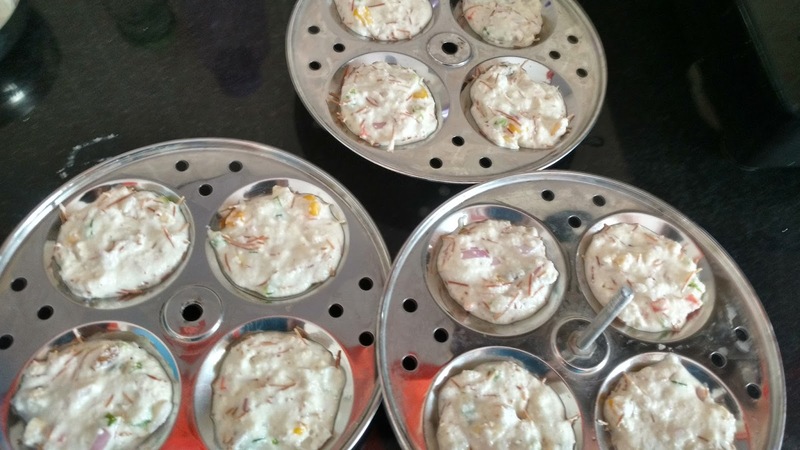 I got so bored eating regular Rava Idlis, but after this recipe I am never going to look back at the plain ones. You can add whatever vegetables you like or which are available with you. It is also a wonderful recipe for giving in the kid's tiffin as you can add your tiny tot's favourite veggies or nuts. It makes a complete vegetarian meal in itself when eaten with sambhar and chutney. 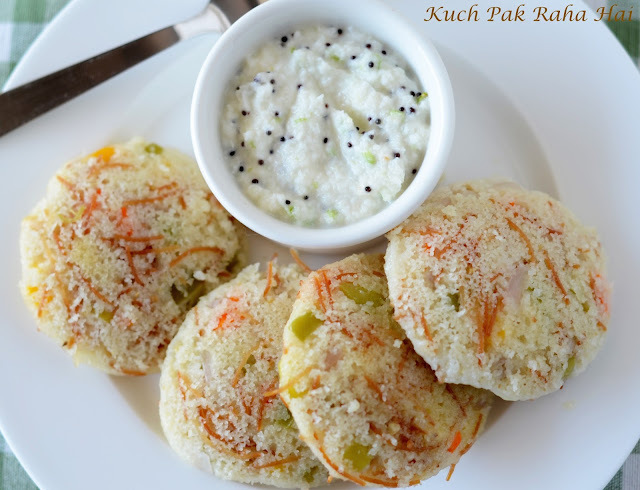 Relish these yummy, soft, fluffy idlis with Coconut chutney or Onion Tomato chutney. 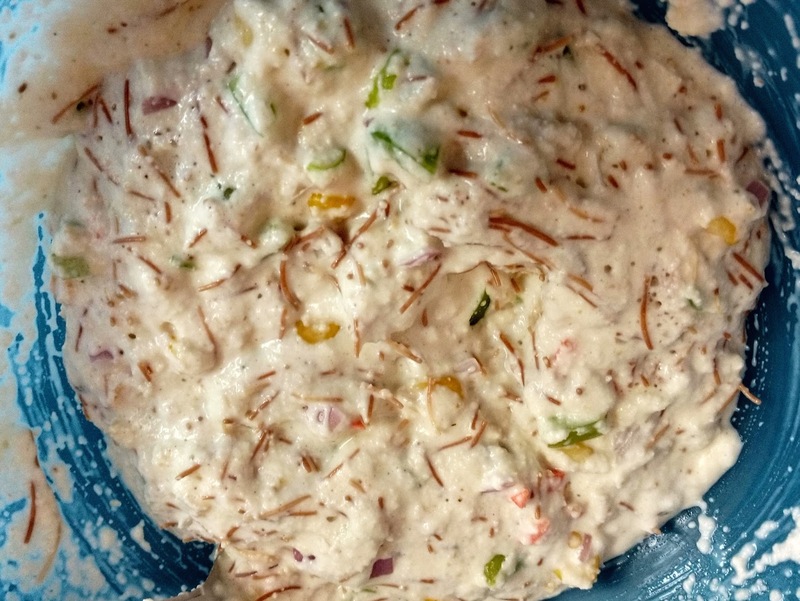 For coconut chutney's recipe, click here and for onion tomato chutney's recipe, click here. Please omit green chillies if you are preparing this recipe for kids. 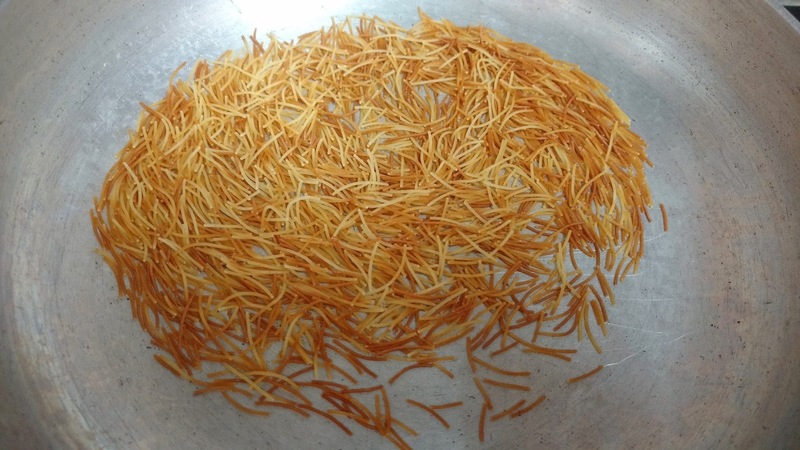 Dry roast vermicelli in a pan till it is golden brown in colour. Keep it aside. Take semolina in a mixing bowl. Add curd, salt, all the veggies to it. Gradually add water to it and mix well to get a thick batter. Add roasted vermicelli to the above batter and gently mix not breaking the vermicelli pieces. Let it stand for 20-30 minutes. Place the water in the steamer to boil. Brush oil in the caves of idli stand plate (Buy here). After half an hour, you would notice that vermicelli has softened up and batter may have turned little thicker. Add one or two tablespoon of water more if required. Add eno to the idli batter prepared in step 3. Gently mix. The batter will become light and fluffy. 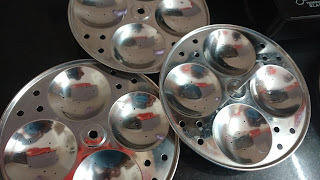 Place tablespoon of idli batter in the caves of idli stand plate. Take care not to fill it till the brim otherwise the batter would overflow in the steaming process. Place the idli stand plates in the steamer. Let it cook for 10-12 minutes. After 10 minutes, check the centre of the idli with a knife. If it come out clean it means they are ready else steam them for another 1-2 minutes. 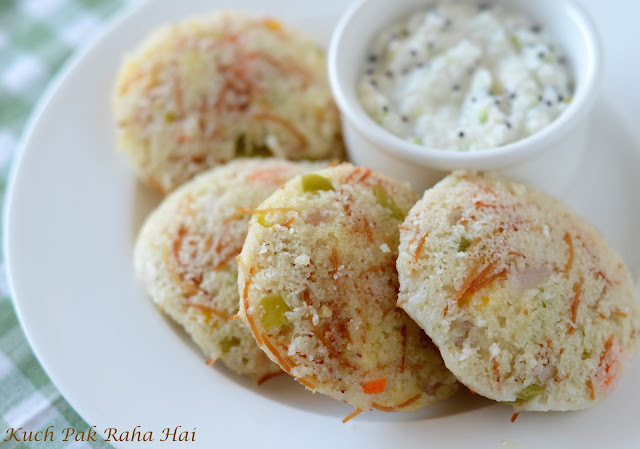 Serve the idlis hot with a melting dollop of butter and coconut chutney! !